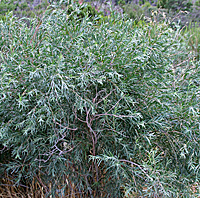 Narrowleaf Cottonwood, Populus angustifolia,growing in lower Frijoles Canyon, Bandalier National Monument , New Mexico, 5,630 Feet, August 17, 2007. 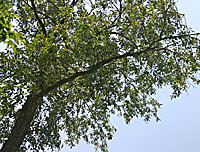 Substantial tree to 60 feet tall with trunk diameter of a meter. 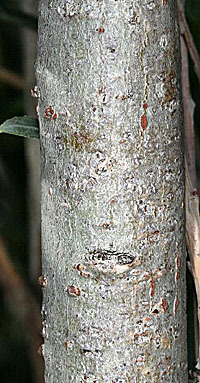 Bark grey with large furrows. 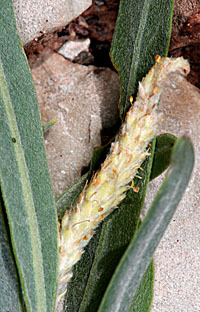 Leaves stem alternate, length 110 mm, width 23 mm. 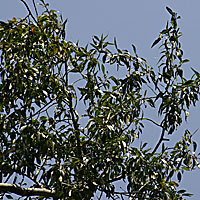 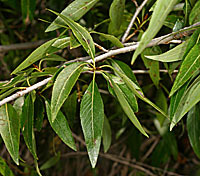 Smaller twigs are speckled green, larger light grey. 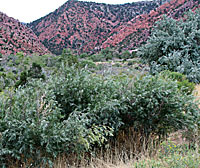 Salix exigua, Coyote Willow, growing in thickets near Cedar Creek, near Cedar City, Utah, elevation 6,000 Feet, August 10, 2006.